We all know I love to fake tan. I have banned myself from sun beds and now that I am pregnant I am reaching for my tanning mitt even more than usual. I will be the first to admit that I have not felt this famous 'pregnancy glow' that everyone talks about, in fact I have felt really drained. To make myself feel a bit better, a warm, bronzed glow is exactly what the doctor ordered. What a difference a brand new tan makes! 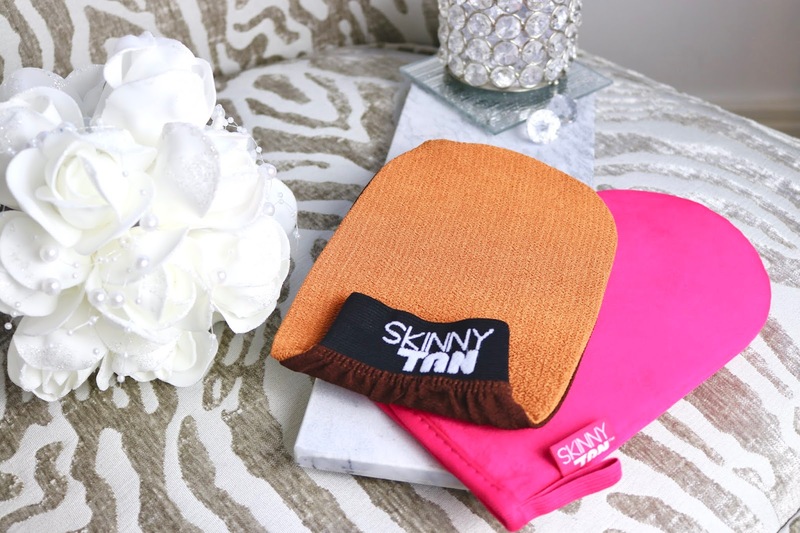 I was kindly sent a box of the new Skinny Tan launches and of course I was very excited to test them out. 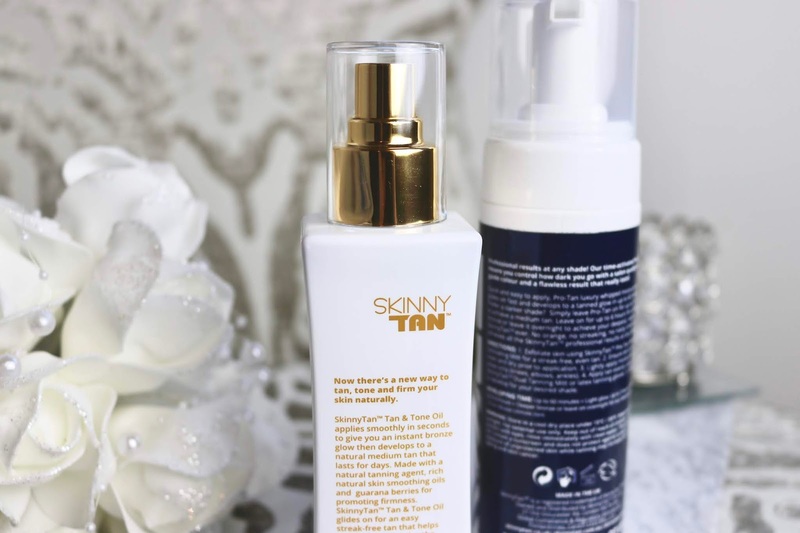 In case you are wondering, you can find Skinny Tan on their website and Superdrug. 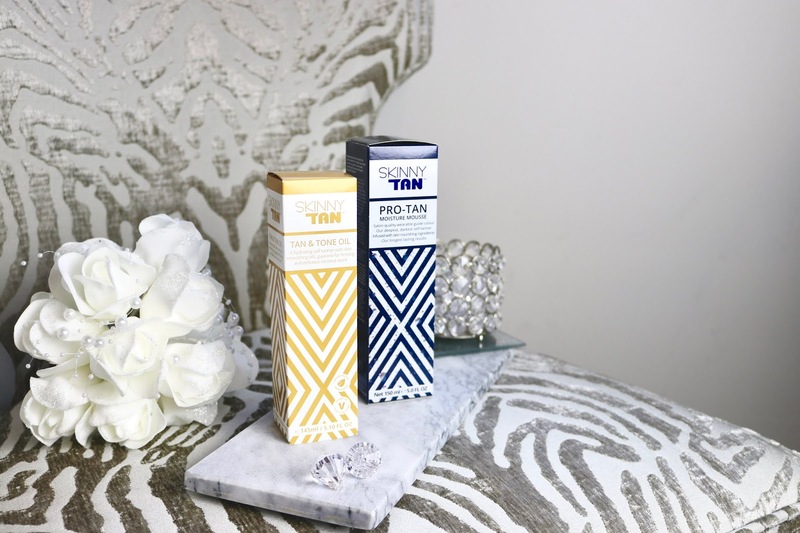 I have been a fan of Skinny Tan for quite a few years now, you can see my previous reviews on the brand here. 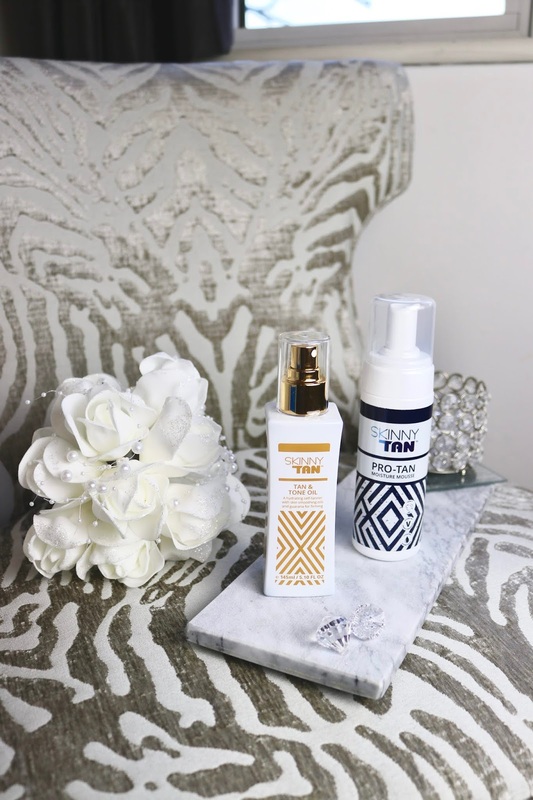 The Skinny Tan Express Mousse is a personal favourite of mine, the tanning outcome is gorgeous and it is incredibly easy to apply. 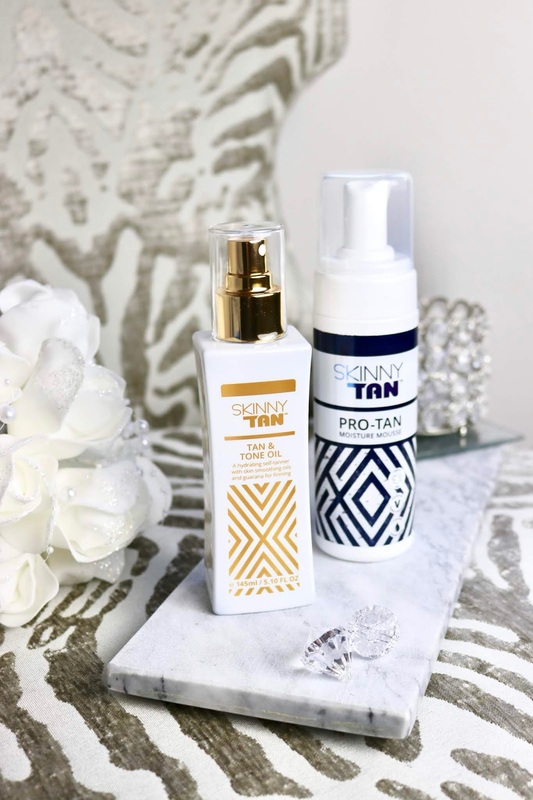 So would the Pro-Tan Moisture Mousse and Tan & Tone Oil live up to the previous launches? First of all, Skinny Tan is suitable for vegans and they do not test on animals, this is always important to mention. If you didn't know, Skinny Tan appeared on Dragons Den in 2013 and all the Dragons were left wanting more. I actually saw the QVC video a few months ago and it was incredible how many people were calling up to get their hands on the range. The tanning formula has a light coconut scent and it just smells divine. We all hate the typical smell of tanning products so I love that Skinny Tan has kept their range smelling like a summer trip to Hawaii. So to test both products, I used the Pro-Tan Moisture Mousse on my left leg and the Tan & Tone Oil on my right leg. 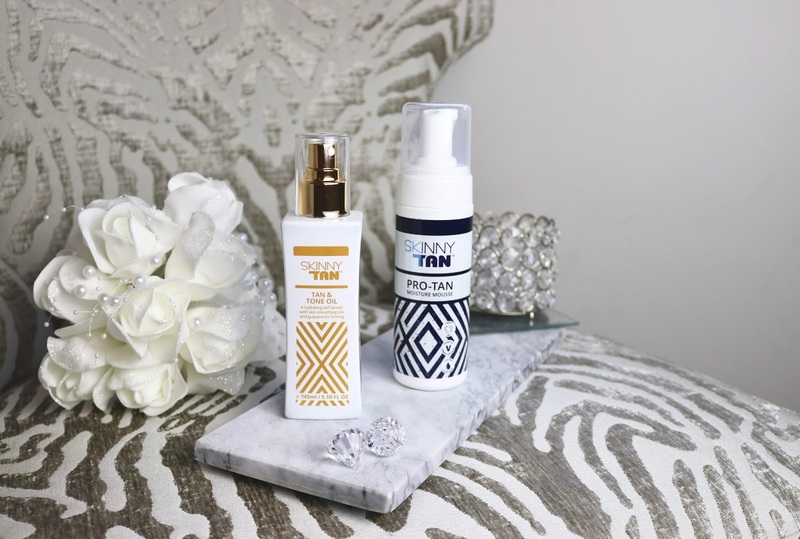 I would say if you are looking for a more intense tan, the Pro-Tan Moisture Mousse is perfect for instant build up. It didn't leave any streaks on my leg and it left my skin looking glossy but not sticky. I was really surprised how hydrating the formula was, considering it is a mousse. I think this makes a great 2-in-1 product for keeping your skin tanned and also hydrated and shiny. I am really impressed with the formula, I really didn't expect the tan to leave my skin feeling so smooth and soft! Now for the Tan & Tone Oil, I was surprised to read on the bottle than you can easily use gloves or your hands to use this product, you just need to make sure you thoroughly wash and scrub your hands afterwards. I love the square bottle design with the gold top, it certainly looks nice on my dressing table! Now when your squirt the oil, I recommend doing this in your bathroom. The oil is incredibly dark so you don't want this squirting on your bed sheets or carpet. I applied a few squirts to my hand and I began massaging the formula into my arms. It left my skin feeling incredibly hydrated and glossy, adding instant colour.